I am 47. Long time weight lifter. 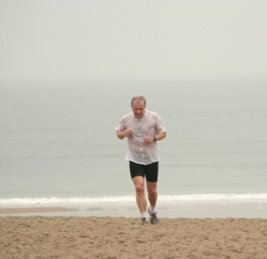 Just started (about 6 months ago) to train for a marathon. Can I and should continue to lift- "somewhat heavy"? Also, is there a big difference between a 47 year old and a 37 year old? I don't have a lot of time for answering questions these days. I'll first answer the age-question: yes, the difference of ten years is quite a big one. Compared to ten years ago your recovery will take longer, you can't be as aggressive with your mileage build-up, etc. You are not necessarily going to be a lot slower though. Especially for endurance events like the marathon the older guys can keep up with the younger ones quite well. Many 40+ age groupers are faster than the 30-40 age groupers! It comes down to years in training, but also time available for training. The 30-40 year olds more often have to factor in small children and dependents. 40+ age groupers more often have gone past that stage and have more time and energy for their training. Now with regards to the weight lifting question. Weight lifting has got tremenduous benefits for runners. It helps to improve posture and can help prevent injuries. I am a big fan of compound movements, e.g. the Javorek dumbbell complexes or circuit-type training in which you get strength and aerobic benefits. Heavy lifting is not necessarily bad as a runner. The only thing I'd look out for is that you don't want your weight lifting to interfere with your running training. When preparing for a marathon, your focus should be on that marathon. So, when you feel that you can't do your running sessions at the right intensity or you can't complete your running training because of the weight training, then it is probably time to tone it down a little. What I definitely wouldn't do is to try and chase two competing goals, e.g. run a marathon and work on building more upper body muscle. It's just going to be too hard when you are going to mix endurance event training with power/explosivity building training. It's probably a good idea to get into maintenance mode with the weights and use them as a cross-training activity, whilst training for this marathon.